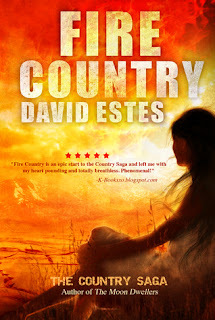 I started Fire Country right after reading The Sun Dwellers. I don't know if it was the hangover I was still experiencing from The Dwellers Saga or Fire Country's different feel but I had a hard time really getting into this. Note that while this is a different/sister series, I've made a few comparisons to the Dwellers Saga to understand or appreciate this story more. I'm sorry. It cannot be helped. I was still pretty iffy about the book until the halfway mark. I think it was the entirely new world of Fire Country that threw me off a bit. People of Fire Country spoke differently and it took me a while to get the hang of their slang. For example, they used words related to or synonymous to fire as cuss words (e.g. What the sear? That's a bunch of blaze and you know it). They also had different terms for their colothing, promiscuous girls, even for time! It's not much of a big deal, really, if they don't use words we're familiar with. Most people wouldn't have a problem with this but personally, it kind of slowed down my reading. I had to pick up on the context clues to understand what they were saying. Thinking about it now though, it's simply part of Estes' world building. After the meteor hit the Earth, the world above ground had to hide until it was safe to come out again. I guess it was only necessary to show just how different they are from the people of the Tri-Realms. They, after all, are a different people all together. The people of the Tri-Realms had the luxury of taking what they once had or knew on Earth (e.g. technology, language) and bringing it underground with them. So it was understandable that they weren't that different from how humans were before the apocalypse. The people above ground however had to start from scratch once it was safe to go out. Once I got the hang of it things, I was able to enjoy the story. At first I didn't like Siena much because she wasn't kickass like Adele, the lead in the Dwellers Saga. Adele had all the qualities I like in female protagonists that I unfortunately didn't see much of in Siena. She was always doubting herself because she feels like she's not as pretty or strong as most girls. Her naivety was kind of annoying too at some point. I thought she was kind of a letdown but after some chapters I came to realize that she's a different brand of pretty or strong. She didn't have Adele's kickass fighting skills and personality, but she had the same burning passion. Her naivety, I think, just showed how trusting she can be of people and that she still had so much more to learn about the world she lived in. It's great that she transformed so much throughout the book. She didn't get better overnight - she had to endure a lot. I think this is one of the aspects of the book that made me like it. She was believable. She made stupid decisions but at the end of the day, she learned from them. I also liked how the story played on the issue of gender roles and equality. I got to an all girls school and we pretty much eat this stuff up! The whole concept of child bearing and the Call was interesting. It's something that I've only encountered in this young adult book so far. Men clearly have the upper hand in the village and women were reduced to bearers and gatherers. They had specific roles for both men and women. It was puzzling though how this system was only strictly enforced when the Call came. There were parts of the book which showed that female Younglings can mingle with male Younglings in Learning which sort of shows that in some ways, they can be equal. I just think that if they did have this divide between men and women then there'd be total inequality. On the one hand though this could also show that there's hope for them to get out of the system. I'm not so sure about it but I do know that I like this bit of the story. Overall this wasn't spectacular for me but it was still entertaining. I like the entirely new world David Estes created in this novel. The action was as exciting and vivid in this book as it was in his previous series. Fire Country is a good opening to the Country Saga. Young Adult dystopia lovers should definitely check this out. I loved Fire Country Sab and glad you got to read it too! The language was just another part of the amazing world building of David Estes, and he did explore some controversial issues with the whole men being superior thing. Hope you will enjoy the rest of the series, and the Dwellers Saga too. Vanessa @ The Ultimate Bookworms.